Hý Jan - Lucie's right - Rome water is fine. You also heard wrong about bottled water. It's very cheap in supermarkets. Water is Rome is perfectly safe. If you like the taste or not depends on you - I don't - but am used to NYC water. And we didn't find bottled water to be any more there than here. I think it's the best-tasting water in the world. It's been written about many times, jarantoo, it's some of the best, purest drinking water in the world, as I understand it, because it comes from the mountains-it's spring water. On the other hand, the drinking water where I live frequetly comes with warnings for pregnant women and immune-system compromised persons not to drink it-and although I don't fall into either of those categories, I wouldn't dream of drinking it unless it was boiled first. Yes, the drinking water is fine. When we went there we brought bottles with us when we went from the hotel and we filled these at drinking fountains around town. Plumbum not Plum Bum All those drinking from roman fountains and taps will testify it tastes great. Right? A related question: Do you need to ask for tap water at a restaurant or will you be offered it? You have to ask for the tap water in restaurants. Almost all fountains in Rome have excellent drinking water. Just fill your bottle or your mouth. One quick caveat: If the fountain has as sign that says "impotabile," don't drink!. There are a few fountains like this, the Mask fountain comes to mind. But most fountains are safe to drink from, and they have no chlorine taste. 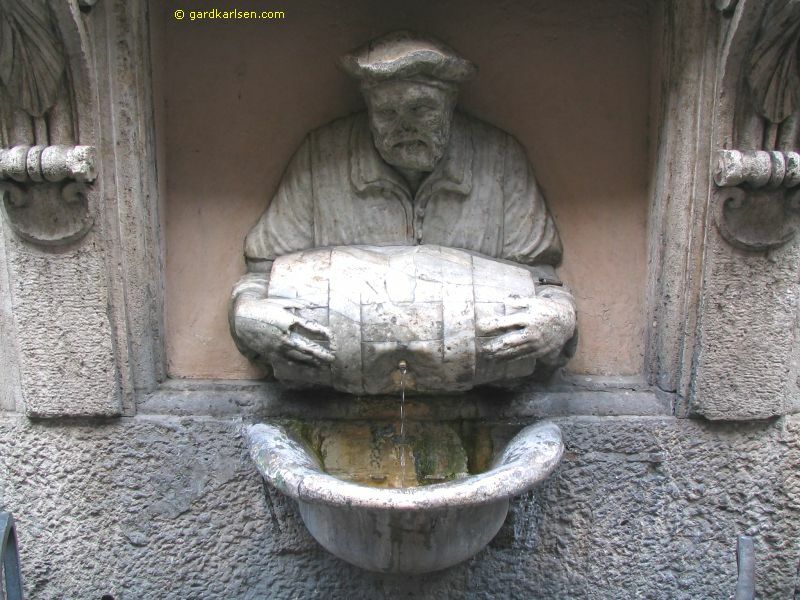 Everybody mentions the 'fountains' in Rome for drinking water... do you mean those 'piped faucets' that are free-standing and drain into the pavement or do you mean decorative fountains like in the piazzas? I saw plenty of passersby stop at the 'piped' kind and get a drink or fill a jug, but I don't think I'd drink from a decorative fountain (think pigeons, people, etc). So could you please clarify? Thanks. Isn't it the water that makes cappuccino in Roma taste like nowhere else? So I've heard. I do know I've never had a better one!